Exciting sci-fi vision of the future, or highway to hell? Smart phones, smart fridges, smart cities — everything is increasingly connected to everything else. The internet-of-things revolution has brought new (and often frivolous) features to the most mundane of everyday objects. But you know one thing it might actually help us to have synced up? our road system. You may have noticed, roads are really dumb right now. They’re expensive to maintain, and generally can’t do much besides allowing above-ground transportation (credit where credit is due, though). But Kansas City tech startup Integrated Roadways is trying to change that. Detailed in a report by the Kansas City Star, the startup’s “smart pavement” vision promises to make roadways safer, and generally give roads a little more 21st century pizzazz, by imbuing the road itself with smart technology. 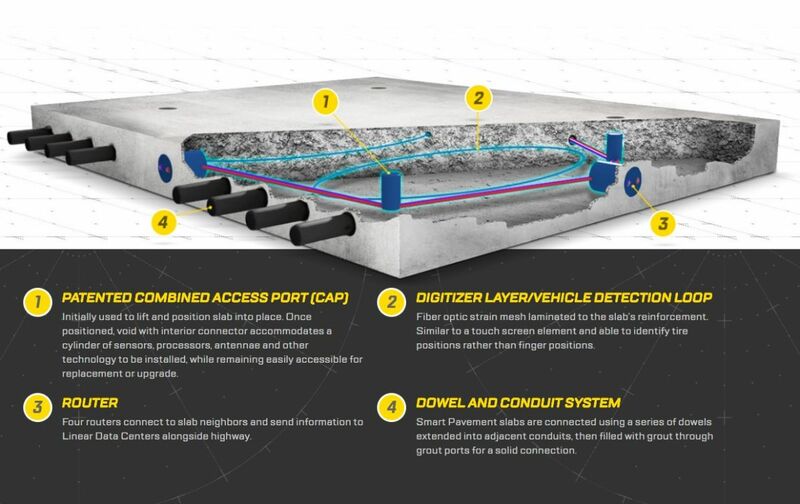 Integrated Roadways’ concept involves replacing common asphalt paving with sophisticated, and — according to their website — “upgradeable” factory-made concrete slabs that give common roadways the ability to detect vehicles, and know where they are in real time. By knowing where vehicles are, and how fast they’re going, smart roadways could theoretically call first responders to the site of an accident. It could also collect real-time data on road conditions and congestion data, letting drivers — and self-driving cars in particular — choose the route that is the most efficient and safe. Integrated Roadways also envisions the system to be the backbone of a much-anticipated “nationwide 5G network” — an ultra-fast wireless communication standard of the very near future — without the need of additional infrastructure by sending data over an integrated fiber optic mesh. So far, so good. But inquiring, skeptical minds must wonder: why is all of this necessary? Conventional asphalt roads have sufficed for a while now. Autonomous vehicles — while far from perfect in their current state — have sophisticated path detection technologies built-in. So why would the road have to inform the car of potential dangers? And what about tolls? In its flashy demo video, Integrated Roadways mentions its roads will be self-funded by allowing third parties to use the data for value added services — think interactive billboards or location-based advertising. And where’s that data going? So far, it’s impossible to get real answers because smart roads aren’t a thing yet. But we might get some soon: Integrated Roadways is working with the Colorado Department of Transportation, according to its web site, though the initiative is still conceptual. You’re not imagining it: it really does seem like everything is connected to a network that collects data about you and your habits, whether you like it or not. And smart roadways like Integrated Roadways’ concept are only another example of that. But it will likely take more than a promise of connectivity and autonomous vehicle safety to convince municipalities and governments to shell out the cash to put it in place. Tesla Model X in Autopilot Killed a Driver. Officials Aren’t Pleased With How Tesla Handled It. The Future of the Car is Undergoing Fundamental Change. Here are Seven Futuristic Concepts.